What was Josh Hamilton supposed to do? Put yourself in his position and say your contract with the company you worked for had expired and because of personal problems in the recent past and on-field questions, they decided to limit their offer to keep you to far below what you would be worth based on performance and what you felt you could get on the open market. Then a close competitor offers you a deal that dwarfs what your former company was prepared to offer and you accept it knowing that you weren’t going to do better in your former home or anywhere else. Then imagine having to return to the town you once worked in with your family in tow and not only do you hear taunts about the past personal problems, but your family and young children are subjected to foul mouthed attacks based on a betrayal that wasn’t a betrayal at all. Even if it was, there’s no reason for your family to bear the brunt of the vitriol. Hamilton returned to Texas to play a series against the Rangers this weekend with his new “company” the Los Angeles Angels. His wife Katie was in the stands with their children and had to call security because nearby fans were getting “ugly” with their comments. Katie Hamilton made some comments of her own when her husband signed with the Angels to the tune of the Rangers let him “date” other people and therefore shouldn’t have been surprised that he left. Katie Hamilton was right. 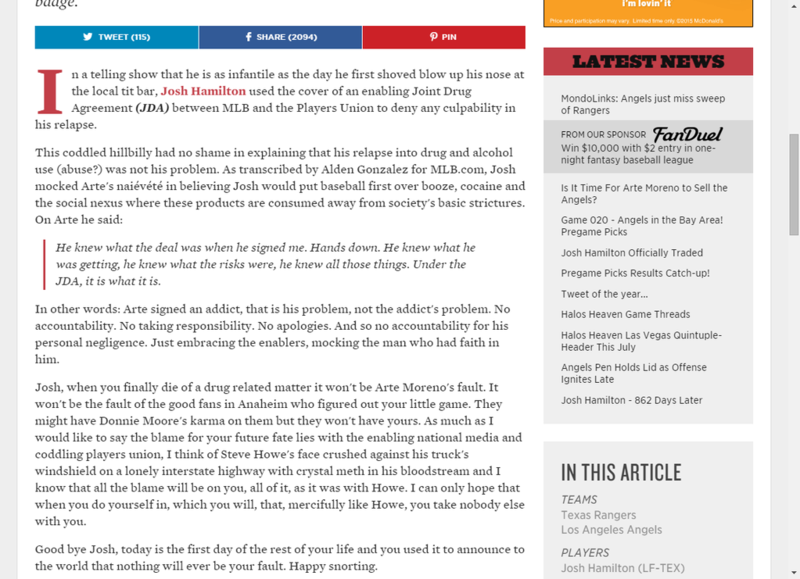 In retrospect, the Rangers are probably relieved that they didn’t have to pay Hamilton $100+ million and wonder whether he was going to start drinking and/or using drugs again. Add in that he’s injury prone and appeared distracted for extended periods in 2012, and it’s not as terrible an on-field loss as is being implied. The fans feel as if Hamilton defected. Did he defect or did he take an offer from the Angels when he knew that the Rangers were ambivalent about him coming back and weren’t going to come close to matching the offer? And should the fans be offended to the point that they needed to abuse his wife? It was a business decision and Hamilton had no choice but to take the deal. It wasn’t personal and it wasn’t a shot against Texas or their fans, but it only takes a groundswell of rhetoric to make it seem that way and for the brainless and probably somewhat beered up fans to try and get a rise out of the athlete by attacking him and his family. Fanbases wonder why there’s no loyalty between the players and their organizations; the media laments the money-hungry athlete; there’s shock as to why players don’t choose to take less money than they can get on the open market to stay in a prior locale; why there’s the perception of being mercenaries and chasing every last dollar. In the end Hamilton didn’t do anything that you or I wouldn’t do and making it necessary for his wife to call security to ward off “fans” who were making inappropriate comments in front of her children certainly isn’t going to make the Hamiltons regret their decision to leave Texas.